When I first decided I had more than a passing interest in writing, I started reading and researching the subject. I also attended several “Lunch and Learn” functions at my local library, and the presenters – all published authors – consistently recommended this book as one of the fledgling writer’s “must read” resources. So, I read it. And I liked it. I have always enjoyed reading textbooks disguised as novels. The picture I used to lead this post is probably not the one his publicist would choose to display. 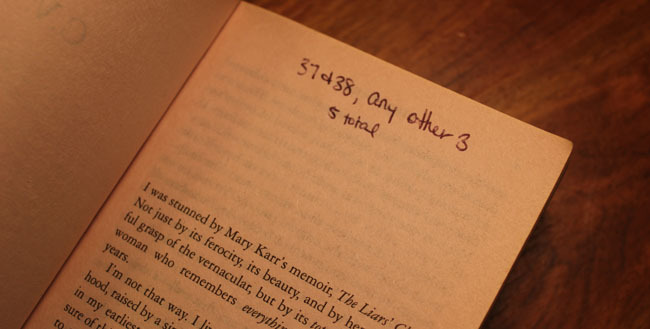 As you can see, this book hasn’t been sitting on the shelf collecting dust – it has travelled through many hands. If I had a book on the shelves, I would want it to look like this, evidence that somebody, somewhere, is reading it. When I searched for the book at my local library I was expecting to find it in the “books about writing” section; I was surprised to find that it was actually cataloged under biography. I eventually found this copy in the Young Adult section under “Required Reading”. The notes written on a few of the pages led me to believe it was used as a resource for English classes in the local high school. As for the content – interesting. Very interesting. 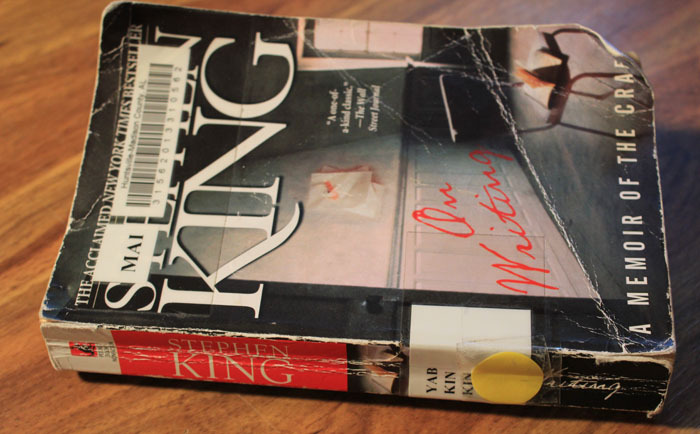 Mr. King actually warns readers that the information in the book is based on his own experiences and opinions. He openly acknowledges that he has, on more than one occasion, operated contrary to standard protocol. And, like so many other amazingly successful people, he strongly emphasized that nothing happened overnight. There was a learning curve to be mastered, and his success was realized after several years of hard work punctuated with multiple failures and roadblocks. In other words – no magic bullet. Speaking of learning curves, I can’t tell you (or perhaps I just don’t choose to tell you) what it was about the book that drew me in and helped me to see my own path more clearly. I believe that this is a very individualized journey for each reader, one that you will have to experience for yourself. The parts of the book that made an impact on me could very well hold no interest for another reader. We are all starting or proceeding from different places on this road to discovery, and the book takes you from where you are. I think that is what makes it so highly recommended by so many people. I will say, reading this memoir actually reinforced something I have known for quite some time – I have my own style, and it’s OK to have my own style, even if it is contrary to standard conventions. Who wants to be conventional anyway? In one section of the book Mr. King talks about talent, using his son’s saxophone experience, and how being interested in something doesn’t automatically equate to talent in said something (and I can vouch for this based on personal experience). He notes that when you have a true talent for something, you enjoy doing it just for the joy of doing it. According to Mr. King, writing is a talent. Before you take exception to that statement, let me just say, I can sing – but I sincerely doubt anyone would want to hear it. Yes. It’s that bad. Definitely not a talent. …but I always wonder two things about these folks: how long did it take them to write the books they did write, and what did they do the rest of their time?…If God gives you something you can do, why in God’s name wouldn’t you do it? I really want to get this book. I’ve had it recommended to me. And by the way, I’m sending some love to you and your blog! Thank you Juni! I am both humbled and honored to receive your nomination.